In a nutshell, this is the kind of experience Sigi – A Fart for Melusina has to offer. After breezing through 20 short but enjoyable platforming stages, we reached the final boss within 45 mins of play. Some fifteen minutes of failed attempts later – which included backtracking to stock up on extra lives – we finally emerged victoriously and Sigi’s quest was over. 58 minutes on the clock, to be exact. 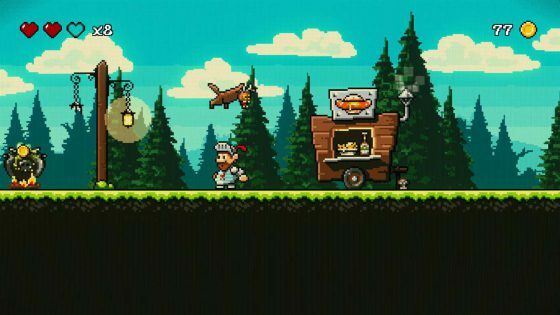 Until this point, this indie platformer from budget publisher ‘Sometimes You’ ticked a lot of boxes. A surprising amount, in fact. The 2D pixel art is appealing and the accompanying chip-tune soundtrack is fittingly jolly. The controls are also responsive, and Sigi himself – a fluctuant knight in shining armour – is curiously likeable, cracking a few jokes while on his quest to win the heart of a mermaid. That’s to say, in terms of presentation alone it’s no slapdash effort – the developers have clearly spent time in this department, as the artwork is mostly well-drawn. 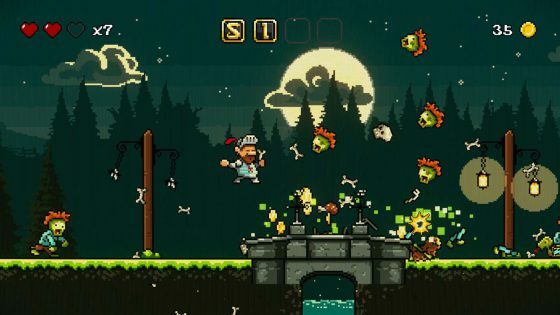 We also approve of the way enemies – which include zombies, witches, and giant spiders – satisfyingly explode into a shower of body parts when defeated, although the constant screen shaking can be somewhat disorientating. There are telling signs that Sigi’s quest is all too brief long before the final boss battle. Each level takes just 2-3 minutes to beat, and there’s little variation. A few new enemy types are introduced along the way, and the final few stages feature swinging blades and similar hazards, but other than this it’s hard to tell stages apart. Moreover, the difficulty level can no way be considered challenging. Extra lives flow freely, and so it isn’t hard to amass a stockpile in double figures – a stockpile the cheap final boss will quickly plough through. Squeezing more than two hours of play out of Sigi – A Fart for Melsuna is a tricky task. Speedrunners may want to take note, as there’s an achievement for beating it in under 30 mins – one of the bigger reasons to return. Going for 100% completion meanwhile involves finding four collectable tiles within each stage (which spell out the word ‘SIGI’) and discovering all the hidden treasure caves, which usually contain one of the aforementioned collectables. Certain stages also additionally contain elusive mystical trinkets to track down, one of which is located way off the beaten path. But while this may sound rather promising, chances are most collectables will be bagged during the initial run. The kindest thing we can say about Sigi is that it knows its place. At a mere £4.19 it certainly isn’t being mis-sold as a colossal adventure that’ll take hours to complete; it’s a bargain basement priced platformer that offers a couple of hours of relatively simple platforming frolics, and absolutely nothing more. Take it or leave it.